Grafx is celebrating 25 awesome years! It All Started With a Guy in a Gorilla Suit. Looking back on 25 years of Grafx Design of Tampa. April, 2016 marked the 25th anniversary of Grafx Design of Tampa. What an incredible train ride it’s been. A coworker from a previous job, Spyro Marousis and I dreamed of having our own marketing design firm. With a couple of credit cards and a big dream, Grafx Design of Tampa opened its doors on April Fools’ Day 1991. An awesome partner and great friend, Spyro handled the design side, while I focused on the client/business side. We did amazing things together. He has since left the company to chase another dream, and I will always be grateful for the experiences we shared. My first desk was a kitchen table, and on it, was my Mac Classic computer, which looked like an 8-inch black-and-white TV. Remember those? Next to it, you’d find my navy blue beeper. No cell phones; very few potential clients even had email addresses back then. Developing a client list was tough work. Cold-calling marketing directors was strictly by phone. My job to find us work was interesting to say the least. Our first client, Celotex, kept us in business until we could grow. I remember sitting at that table calling everyone I knew – friends, relatives, and coworkers from previous jobs. Looking back, I think our timing was just right. In Tampa, there were a handful of large advertising agencies, and we were a small boutique agency offering the same services, but at a much more reasonable cost because of our low overhead. Our art department consisted of only two or three designers at the time. Several phone calls later to a friend of a friend of a friend, we got wind that Busch Gardens was opening a new gorilla exhibit, Myombe Reserve. Our small team worked day and night to prepare concepts for billboards, brochures, counter cards and more for our upcoming presentation with the Director of Sales. The excitement made our heads spin! Forget the dog-and-pony show; we were about to knock out this pitch with a gorilla show! I had the time of my life, and they loved our presentation! Thus began a 19-year relationship. The Grafx train was picking up steam! 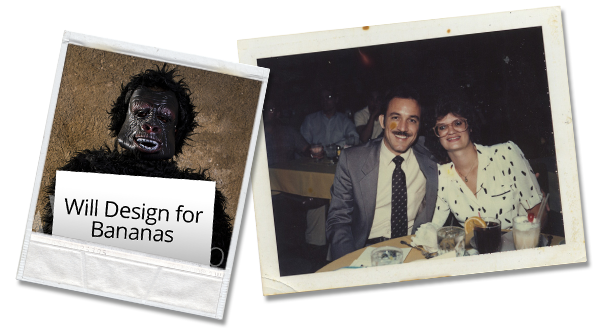 After the Busch Gardens team went bananas for our presentation, we established relationships with all of the then-Anheuser-Busch theme parks across the country. Over the years, we partnered on countless projects, including the logo for the Montu roller coaster, years of building Howl-O-Scream websites, and a vehicle wrap for the Kumba roller coaster, spontaneously concepted on a napkin at lunch with the client. Soon we outgrew our space and moved to Ybor City. Our client portfolio kept expanding, now including campaigns for SeaWorld Parks, promotions with fast food chains McDonald’s, Burger King and Taco Bell, and magazine ads for top brands like Revlon, Almay and Heinz – to name just a few. As you can imagine, we have so many stories from the last 25 years. I will never forget driving my burgundy mini-van on 275-N to Busch Blvd. with a 6-foot gorilla in the passenger seat and a precious cargo of presentation materials in the back seat. The Busch Gardens staff watched us with anticipation while we waited for our appointment in the lobby at the corporate office. At that moment, we learned that the meeting was no longer with just the Director of Sales. Instead, we would present to the entire marketing department. I was soooooo nervous. Dave Pricket at Dimensions – How I miss your jokes and the sound of your cowboy boots on our tobacco-stained wood floors! 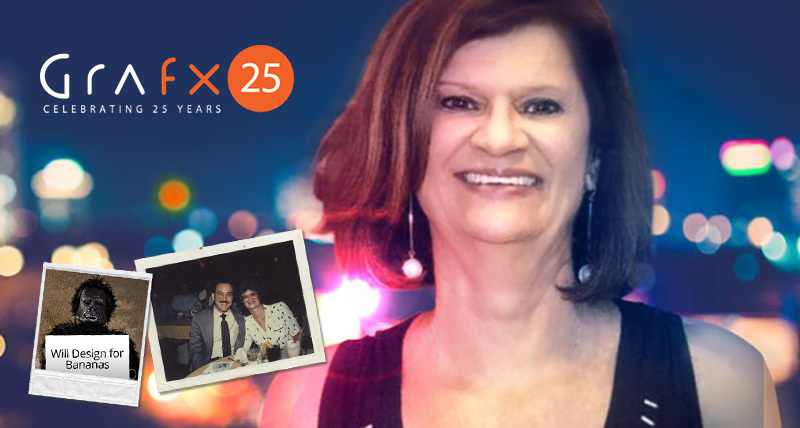 Throughout these incredible 25 years, I’ve shared so many unforgettable memories alongside our dedicated Grafx team members. I am most grateful for all of your contributions to the success of our company, and your talents have never gone unnoticed. When I could no longer handle the account service and volume of trafficking and production coordination, I hired Sherry Ford, who came highly recommended. After two weeks of my refusing to let go, she sternly stated, “It’s time” and proceeded to swoop in as my Superwoman, tying up the loose ends and covering my tail, all with the most honorable work ethic and keen attention to detail. I will never forget your loyalty and service to our company. Both Traci Levines and Tara Rivera deserve a special thank you for keeping our office running smoothly, day in and day out. Also, I need to thank Amber Payne Guenther for her several years of account service and tremendous dedication to our clients. She was an incredible asset to our team, demanding excellence from our art department every day. Our infamous gorilla Kevin Gil, I thank you for serving many years with us as well as one of our Creative Directors. Your talent and work ethic are some of the finest. Our database specialist Nick Bobak – thank you for your many years of service and the knowledge you’ve shared. Oh my, the crazy late nights we put you through! (Remember the time you pushed the SeaWorld site changes live from your cell phone?!?) Thanks for all you do for us; you are such an important part of our team. Special gratitude is due to the team leaders at Grafx today. Kevin Stone, Dekin Dorcas and Steve Ehrlinspiel are true warriors. Their loyalty, talent, commitment, youth, enthusiasm and ambition are the future of our company, and I have the utmost respect for them. With their leadership, we are doing some of the most exciting and challenging work we’ve ever done. I can’t forget to thank my daughters Brittany and Lauren for putting up with the countless takeout meals and my long work hours. Love to you both! On our 25th anniversary, we have all of our clients to thank most of all. For me and the entire Grafx team, the relationships with our clients account for some of the most fulfilling and strongest friendships that I know will last a lifetime. I am honored by their great loyalty through so many years. Our industry may have changed, but the people we meet and build relationships with remain the same. I will forever be thankful for the opportunities to know them. Even though our products and services have evolved since our first big presentation in a gorilla suit, the reason why we come to work everyday has never changed. I still love what I do. Here’s to another 25. Cheers!